Thimbelina: Christmas gift number 2! Today's project has been to start a Christmas pressie for my little 3yo niece..... it's going to be a draw-string library bag, which I'm hoping to get finished later this week! The back will be much the same as the front only without the writing, just as soon as I get some more vliesofix! 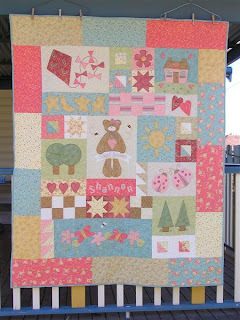 I couldn't find a pattern that grabbed me for the quilt, so I used the Hatched and Patched "Boys Toys" pattern.... but as you can see I made a lot of changes, including making it much bigger! Looking good Sis. She is going to love it!